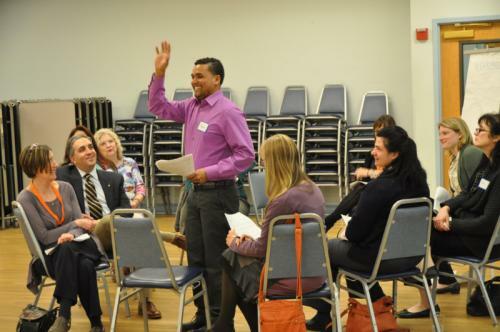 Everyday Democracy is currently working with New Hampshire Listens (NH Listens) to embed inclusion and equity practices in its work with a coalition in Nashua, New Hampshire. NH Listens is a civic engagement initiative of the Carsey Institute at the University of New Hampshire and an anchor-in-training partner of Everyday Democracy. The aim of the partnership is to enhance NH Listens’ knowledge and effectiveness in embedding inclusive and equitable civic practices as a future anchor institution in the Granite State. Through this partnership, NH Listens is gaining knowledge and skills as the group provides organizing, facilitation and dialogue support to an engagement project underway in the city of Nashua funded by the NH Endowment for Health. The project is bringing people together across Nashua to talk about and find ways to be a more welcoming place, especially as the community is becoming increasingly more diverse. Every step of the way, Everyday Democracy’s Program Officer Gloria Mengual and Senior Associate Sue McCormack are providing NH Listens with coaching and training on equity, helping NH Listens to transfer equitable practices onto this effort. Michelle Holt-Shannon, Associate Director with NH Listens and facilitator for the Nashua Immigrant Inclusion Initiative, shares her perspective on this project and her collaboration with Everyday Democracy. In the beginning, we simply wanted to help United Way of Greater Nashua plan deep and broad engagement for an immigrant inclusion project. Then I was asked to facilitate the planning phase, when we received word of funding from the NH Endowment for Health. NH Listens and Everyday Democracy have been steadily “making the road together” as we move toward a more formal anchor partnership, and now we have a concrete project to run with. The focus on equity in this partnership has a particularity even as it also can be generalized across issues and identities. My deepest equity work has been about domestic black and white racial equity, LGBT equity, and gender equity. Still, when faced with language differences, citizenship status, and race through a non-US centric lens, I feel stretched. Knowing Gloria and Sue would be with me in the project has been significant in several ways. They think through the sticky issues. They give me courage as an outsider to keep inviting the Nashua community to be courageous. They’ve been there. With Everyday Democracy, we have access to stories from communities all across the country. Gloria and Sue are able to make connections and illustrations that are relevant to our work and lead to an ability to anticipate next steps. I have found the “coaching” phone calls with Sue and Gloria invaluable. This is my chance to talk through strategies, ideas, and design exercises. Experiencing accountability to a national partner on racial equity is new for us and makes us more conscious in a good way about our words, actions, behaviors. They think through the sticky issues. From the beginning, project partners have been focused on ways to make sure the planning group is welcoming and inclusive. We continue to reach out and try to identify community leaders from various newcomer communities and long term communities of color in Nashua. Partners around the table have spoken to equity issues consistently, particularly in making sure newcomers are part of the planning. Still, we have been conscious of the traditional, powerful organizations such as the Chamber, Nashua Mayor’s Office, and the United Way. In fact, this project began with many of the traditional, professional, white leaders in Nashua naming the issues of division, the need for broader leadership, and the need to address the “two Nashuas” that exist. 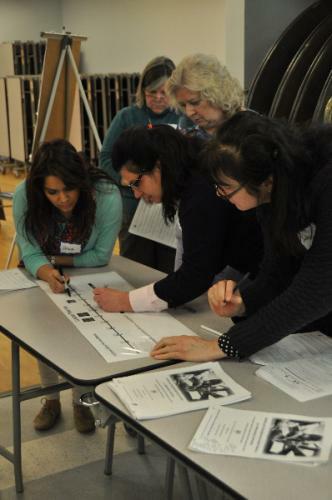 Gloria and Sue are helping us attend to a capacity to build relationships across differences – race, class, and citizenship status, and to be sure that the definition of the community challenges are shaped by multiple voices. They give me courage as an outsider to keep inviting the Nashua community to be courageous. One of the primary challenges I am experiencing is creating a less “Western” meeting environment so that people of various backgrounds feel more welcome and can access the planning process in multiple ways. Finding common ground ways to bring people together who have very different personal and professional responsibilities (some are paid to be there, some not) will be critical to our long term success but changing the “usual rules” is not easy. As this project develops, we are also in the early founding stages of Nashua Listens. From the beginning the founders of Nashua Listens named the need to build a “bigger rolodex” and the racial make-up of the group is on their radar. Likely, one of the first community conversations for Nashua Listens will be about the immigrant inclusion project. As we continue our work, having Everyday Democracy in this kind of deep partnership with NH Listens brings a wealth of knowledge to our work on the ground in Nashua. Learn more about NH Listens’ work across the state in this article by CommunityMatters, a program of the Orton Family Foundation.